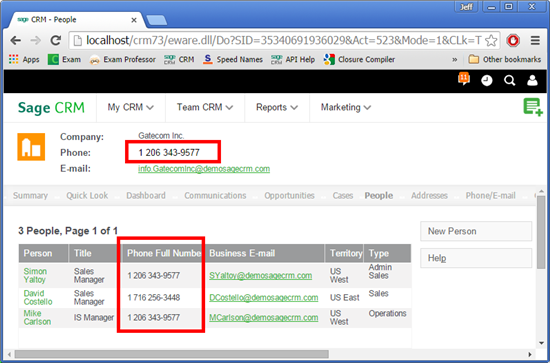 Why do Phone numbers appear in the Company and Person screens when they are stored in the Phone table? This is a follow up to the article I wrote previously called "Understanding the CRMEmailPhoneData table". That article explained that the CRMEmailPhoneData is a utility table and that it's job is to speed up reports. It holds a row for each company or person with that company or persons Business Email, Business Phone numbers and Fax phone numbers all in one row and the table is maintained by triggers on the PhoneLink and EmailLink table. But if you go to the company page or look at a list of people you will see the phone number listed. The list of people under a company is the best place to start. Within the Administration Customization area it is easy to see that the Company tab group contains a call to the system action Person List. That system action calls the list block 'PersonList'. You would need to look directly in the database but the meta data table 'custom_screenobjects' shows that the PersonList is based on the view vListPerson. The view draws information other views called vPersonPE and vCompanyPE. Some of the fields from those views are used to derive the field 'pers_phonefullnumber' and it is important realise that the Phone number information is not held in the person table. Fields such as Pers_PhoneCountryCode, Pers_PhoneAreaCode and Pers_PhoneNumber look like person fields because they have the 'pers' prefix but they are derived in the vPersonPE view. It is here that we can see that the view pulls the phone and email information for the person record from the CRMEmailPhoneData table. When we look at a company summary page and the top content it will display the default phone number for the company. The CompanySummary system action uses the view vSummaryCompany when the company summary screen is loaded. You won't see this in the meta data but you will see this in the SQL log. You can see that both the vPersonPE and the vCompanyPE core views are referenced. The company phone number is provided by the vCompanyPE view definition. 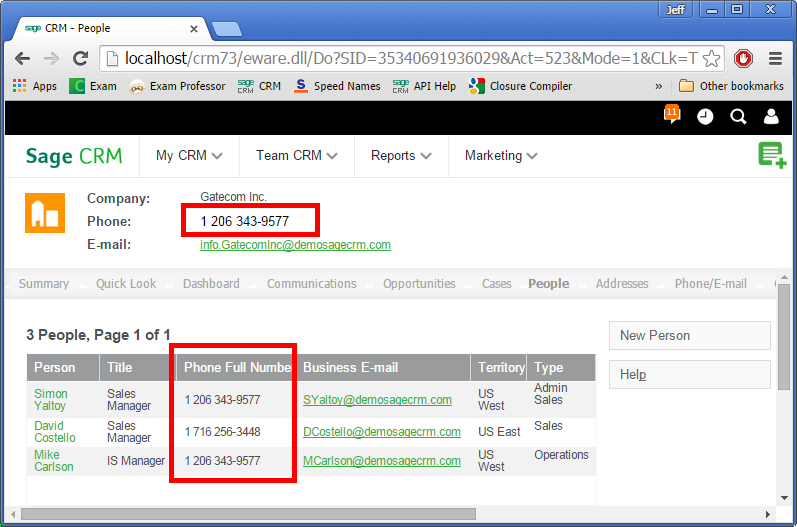 Which in turn draws the Phone and Email data from the CRMEmailPhoneData table. Thanks Jeff! Knowing how to find which view the action is associated with will help tremendously!